ePrompter is a great, free Windows software, being part of the category Communication software with subcategory Email (more specifically Web Mail). Since we added this software to our catalog in 2007, it has obtained 35,081 downloads, and last week it gained 10 downloads.The current version of the software is 2.0 and its last update happened on 9/06/2007. It's available for users with the operating system Windows 95 and former versions, and it is only available in English. ePrompter is a not that heavy program that doesn't need as much storage than the average program in the section Communication software. It's a software frequently downloaded in countries such as India, Bangladesh, and Nigeria. 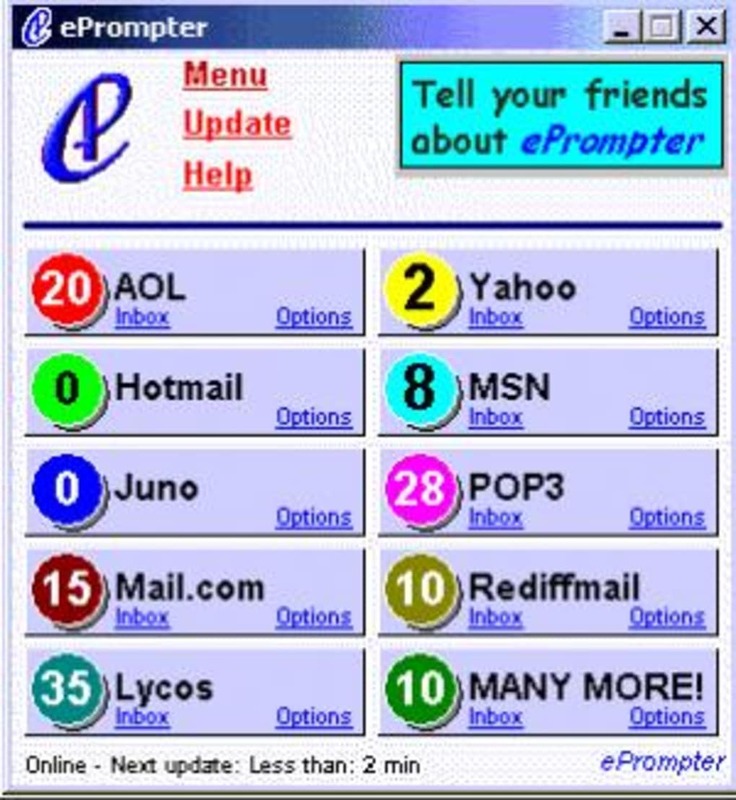 ePrompter automatically and simultaneously checks and retrieves your e-mail messages from up to 16 password-protected e-mail accounts, such as AOL, Hotmail, Yahoo, POP3, Earthlink, Excite, Juno, GO, Gmail, Email.com, Mail.com, Mindspring, MSN, MyWay, OneBox, Rediffmail, USA.net, and hundreds of other e-mail domains. ePrompter not only lets you compose, forward, and reply to your retrieved messages, but also gives you the ability to delete unwanted spam or suspicious-looking mail without having to launch your e-mail program or having to go to your Web mail's site. ePrompter notification features include a unique rotating tray icon and a choice of five screensavers that let you know at a glance the number of new messages in each account, as well as audio alerts for new messages. ePrompter also includes autodial for automatic message retrieval. What do you think about ePrompter? Do you recommend it? Why?